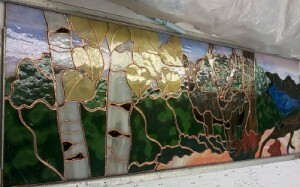 We are working on 4 stained glass panels of the Grand Canyon in the 4 seasons. These are small panels, requiring lots (and lots and lots) of little pieces, and some tiny ones. 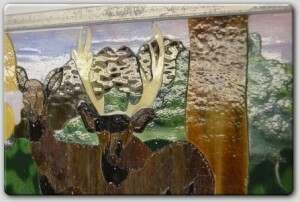 Yes, those antlers are 2″ high. Really. And they are now foiled with 11/64ths silver-backed Edco foil. Edco offers the awesome narrower widths of foil we love, in different backings. We are using 11/64ths, 5/32 and even some 9/64ths on these 4 panels. Oh wow, look at all of that lovey lovely lovely glass!!!! Its awesome, Its really a lot of work and I love it.